Have you ever wondered why a good majority of the time when people get something easily they seem to lose it just as easily. For instance, people who’s source of income is crime never seem to get rich except for temporary periods of time. For those of us that abide by the law, when we download free ebooks or get books for free we don’t read the majority of them. I swear, I have loads of free books that I got off Amazon and 80% of them haven’t been read. Of the books that I have paid for, and I have many of those too only one hasn’t been read even after a year and I keep thinking I need to read it. Well, there is actually a scientific reason for this. People who study human behavior and how the brain functions call it negativity bias: people give a lot more weight to losses and negative events than they do to positive events. What does this mean for your life and business success? If you feel you have invested in something, especially learning something new, you’ll take it a lot more seriously. There are two ways you can invest in knowledge: either with money or with time. If you decide to learn something using all the free internet resources available, even if it’s quite simple you will not find all the information in one place. You’ll likely have to use several sources to figure out whatever you need. You value your time and having done the hard work to understand something you’ll be sure to implement it into your life or business. I’ll give examples from my own life. In 2010 I paid about £300 ($500) for an online writing course. You were set 10 pieces of work but only received subsequent installments when you completed one set of work. Five years later I still haven’t done 80% of the course. Admittedly I was an employee when I signed up to the course and therefore was time poor and I was also on a huge, 6-figure salary so the investment of £300 wasn’t significant to me. Fast forward to 2013. I wanted to join an entrepreneur networking group and program but the fee was £7,000 ($12,000) and I didn’t have that money free. I saved for 6 months and joined the program and to-date I have never taken anything more seriously. I did all the work set to A* standard and I never missed a networking day. That was a lot of money to me and I wanted to get my money’s worth. One of my favourite authors Grant Cordone expresses exactly the same thought in If You’re Not First, You’re Last. Whilst time and money are two key ways you can invest in something there are other factors that can drive you such as guilt or a coach that pushes you. As a teenager I always felt guilty that my parents were investing so much in my education so that pushed me and it does push many other people. The education was free to me but it was costing someone that I love (mummy and daddy) dearly and that was enough to push me towards success. There is also a common trend in which one generation works hard to build wealth and subsequent generations lose it. The explanation is the same. The parents invest a lot of time and money building a business and personal asset base. They know the pain of their work and they don’t spend that hard earned cash without careful thought and planning. Their children enjoy the fruits of this labour but have no real connection to the pains their parents went through or the poverty their parents might have grown up with so that wealth is free to the children. You can’t really enjoy the sweetness of success without some concept of the pain of hard work. If someone does all the work for you, you don’t have any real goals to get you out of bed every morning. You don’t care about preserving the wealth that someone else created as much as you would if you made it yourself. In summary, if you want to achieve real success you probably have to roll up your sleeves and get your elbows dirty. Unfortunately that’s the only way success comes. Free stuff won’t take you very far. If you’re so into free stuff that you fail to see the value that exists in many paid resources then it could be the reason you’re stuck in a just-over-broke (j.o.b) cycle. Thomas Edison said it best when he said, “We often miss opportunity because it's dressed in overalls and looks like work.” I’ll change this a little to apply to this new world where many people want things for free by saying, we often miss opportunity because it requires us to invest time or money. Spending normally involves small amounts at any one time but an investment normally involves a chunky cash out flow all in one go. Investing is scary, it’s more risky and as such it’s easier to just not do it. I was thinking these things when one of my friends was telling me about how she wanted to invest in a personal development program but thought it was too expensive. It was going to cost her about £2,000 ($3,200) which is a lot of money to spend in one go but if that £2,000 helps to build a business that produces £2,000 worth of profit every month faster then it’s not a big deal. In fact, it’s a fabulous investment. These are not necessities, they are her life’s pleasures. I’m not even counting dinners because let’s face it, a bit of socializing is necessary, it’s just a matter of picking places that don’t break the bank. Anyway I would conservatively estimate that £40-60 is spent weekly that wouldn’t hurt her to completely eliminate – if you annualize this – I’m a big fan of annualizing –that’s over £2,000 to £3,000 a year. However, it never feels like that when you’re spending it in £3 to £10 increments. That said, you need to spend money wisely: there are a lot of great courses out there but you need to do the one that is relevant to you at that time before moving on to the next. I make it a point to do at least one course every year. When I worked in investment banking I did courses for fun (for example, I did a course in Black History, another in Aromatherapy and Massage, an art class etc.) and ever since I quit the rat race in early 2012 I have focused on courses that help the business. Anyhow, the main point I want to relay here is that you should analyze the return you get when spending money instead of the absolute amount. A suit can be an investment if it helps you get that high-powered job but most of the time, expenditure on clothes is not an investment. Do courses for fun to see how they help to develop your creative side. Indeed, spending less time doing what most people do, like spending lots of money on complete rubbish, can only be good for you. Invest instead. I was inspired to write this insight by watching a friend of mine practice for a competition, and against all the odds come out second. She had a tough upbringing. I won’t go into the details but let’s just say that she didn’t have the most loving nor the most encouraging family and they certainly weren’t great role models for her becoming an entrepreneur. Nonetheless, become an entrepreneur she did. Her own passion in life is to be an inspiration to her children. She doesn’t do that by telling them what to do, she just lives her life and lets them watch. Recently, she entered a competition and was very determined to win the top award. The entry process required a lot of preparation and a lot of practice on her part. She not only had to practice but she had to run her business at the same time. Her children watched her practice. She asked them for their feedback in the same way that she would ask anyone else that she practiced in front of. Ultimately she came 2nd out of a possible 40 individuals; a fabulous result. I thought to myself – what would her kids have thought if she practiced so hard and still didn’t come so close to winning in the competition? Would that have made them think hard work is not worth it? In the end, I realized I was thinking about it all wrong: the mere fact that she practiced as hard as she did for as long as she did means whatever the result, they would have been impressed by their mother’s effort and they would have empathized with her regardless. She would have gone home and told them that, “As hard as I practiced, everyone else practiced way harder and that’s why they beat me.” The lesson to them would have therefore been, you need to work harder than you saw mum working to progress. The best way to spend an evening is to sit and watch TV series. Did your parents do this? Do you do this? Could you break the habit and perhaps spend some evenings watching business documentaries, reading books and actually interacting with your family face to face, no phones and laptops? Holidays are for doing nothing. In my case, my dad told me that his father said holidays were an opportunity to do work that you don’t normally get to do and I am carrying on the family tradition. Weekends are for lying in. Lie in if you need to but making it habit is just a waste of time. There are many more things out there that are more fun than sleeping. Get to bed early during the week so you don’t have to spend every weekend playing “catch up”. Work isn’t fun – it should be avoided at all costs. Kids can really benefit from seeing you enjoy doing tasks that other people consider work. If your parents always complained about work, came home frowning, perhaps you can break that awful cycle and emphasize the elements of your job that you enjoy. I have never heard my parents complain about having to go to work or to do work, ever, and I’m only realizing that as I write this insight. Perhaps that would explain my attitude towards work. I just get on with it. My husband thinks I’m a workaholic but the truth is I just see work as a part of my life – one that I enjoy although it can get tiresome at times. Study and reading is for school time only. Many people leave school and never read regularly again – those that do normalize reading for their kids and those kids are likely to continue the tradition. These are just a few examples. I’m sure you can think of many more, like the culture of fixating on football or some other sport. TV culture is probably the worst of it and I myself am not immune to it. I was complaining about barely having enough time to do work since I gave birth but in 8 days I watched all 24 episodes of Season 1 of “The Good Wife” – yet, I have lots of educational DVDs that I have paid good money for waiting to be watched (!). I’m not perfect but I make a concerted effort to be different. 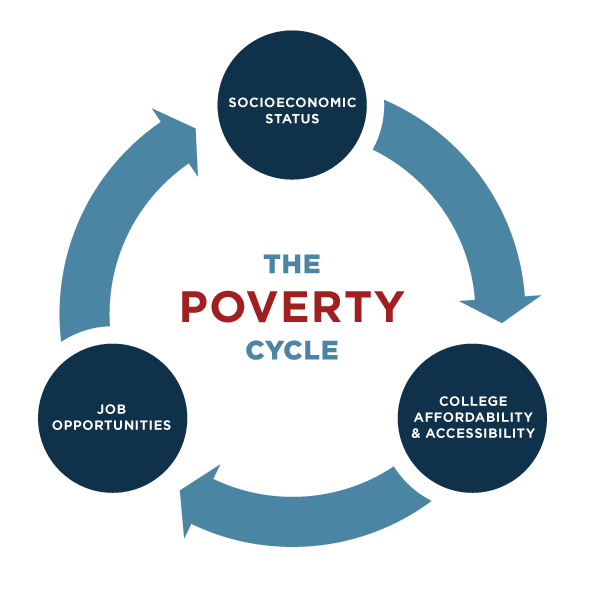 How do you think parents can break the cycle of poverty?